Our last Pack Meeting of the year is fast approaching. 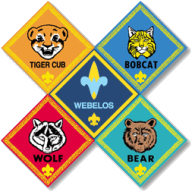 This year our annual Crossover Ceremony (aka Scout Graduation day) will be held at Washington Crossing Park – Thomas Nelly House Saturday June 3th. Please note the exact time and location below. There are several Washington Crossing areas on the Pennsylvania side of the Delaware. This meeting will include a family Bar-B-Q, a fireside Crossover Ceremony, and a campout (optional). All family and friends are welcomed to attend and celebrate the accomplishments of our scouts. Please bring a camp chair or blanket to sit on. Please also repond to the evite sent on May 22 so we can get a ballpark count on who is attending. Directions: From Sycamore St head North on 532, turn left on Rt 32 (River Rd). Be sure NOT to cross bridge to NJ. The location is about 5 miles on the right. Look for the scout camp sign. All families are welcome to stay for the camp out. The pack will provide a late night snack and donuts/milk for Sunday morning. Per BSA rules, Scouts are only permitted to sleep in tents with their parents. No scout is permitted to sleep in a tent with any other adult.